As the long presidential campaign winds down, GOP nominee Donald Trump’s claims that the process is “rigged” against him – and suggestions that he might not accept the result as legitimate if he loses – seem to have struck a chord with his supporters. In a recent Pew Research Center survey, 56% of Trump voters said they have little or no confidence that the election will be “open and fair,” compared with 11% of Hillary Clinton backers. Among those who say they strongly back Trump, nearly two-thirds (63%) say they have little or no confidence that the election will be fair. 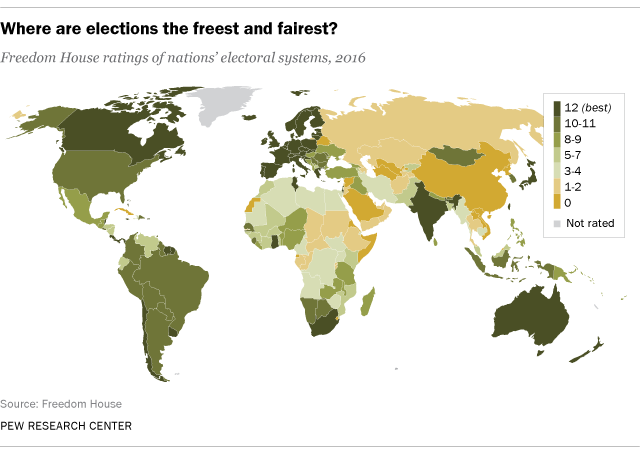 Given that level of skepticism, it’s worth noting that the U.S. generally ranks highly on the overall freedom and fairness of its elections when compared with other countries, though not without some caveats. Freedom House, a nongovernmental organization (though it receives funding from the U.S. government), has ranked nations on political and civil rights for more than 40 years. In its most recent report, Freedom House gave the U.S. electoral process 11 out of 12 possible points on its “electoral process” scale – the same rating the nation has had since 2007 (when its score was raised from a 10). While well-known and frequently cited by media and academics, the Freedom House rankings aren’t the only cross-national measures of democracy. The Economist Intelligence Unit, an analytics and forecasting business affiliated with the British newsmagazine, has produced its “Democracy Index” every year or two since 2006. This year’s version gives the U.S. 9.17 out of 10 points in the “electoral process and pluralism” category, one of 21 countries to receive that score (some of the others: Cape Verde, Denmark, El Salvador and Japan). Besides whether elections for the head of government, national legislature and municipalities are free and fair, the EIU’s electoral process/pluralism measure also covers voting restrictions, campaign finance and the orderly transfer of power. Despite that assessment, there are stark political divides on certain democratic norms. 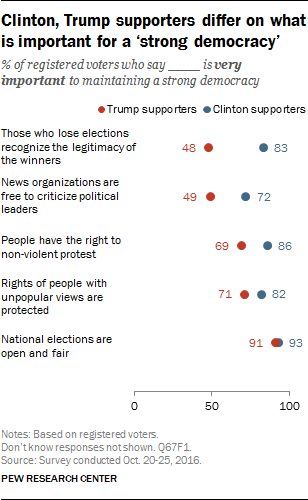 In the Pew Research Center survey, 83% of Clinton supporters – but just 48% of Trump supporters – said it was “very important” to a strong democracy that those who lose elections recognize the legitimacy of the winners. And while 72% of Clinton backers said it was very important that the news media be free to criticize political leaders, only 49% of Trump backers said so.